Situated three kilometers inland from the city of Saihat in Qatif Oasis is a large fossilized sand dune known as «jebal Qurain», but which in past time was apparently called Muraikabat. The reason for the variance in names is not known. It is prominent landscape featured rising over 40 feet above the level o the surrounding date palm groves. On the Gulf side it is bounded by chicken farms, on the inland side by an industrial establishment, and a connecting road from Saihat to the main Jubail-Dammam highway bounds it on the south. The Jebal is now surrounded by two separate heavy wire mesh fences and it is now impossible to drive up to summit ridge as was the case in past. It is easy to pick out this old and easier approach road. In pioneer old exploration days the Jebal was used as a ground survey site and recent survey party left a station flag flying from a pipe flagpole at the highest point. The Jebal is covered with sparse vegetation and the summit ridge runs in a weak S-shape curve for 280 feet from southwest to southeast. The exposed strata is 15 feet thick on the south end and dips 30 degree west. Holes in the flock face indicate where the more resistant nodules have been weathered out. The ridge is not continuous but broken up by cracks into segments. On the southwest side there is a small sloped surface but the remainder is uneven and heavily weathered and pitted. Scattered on various parts of the ridge are about 30 rectangular pits tat have been incised wherever space was available. 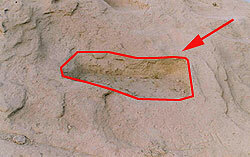 The pits are not direction oriented and not uniform in size. The average size is approximately three feet in length by tow feet in width or less. some are very shallow in depth, only a few inches, and have been filled by flowing soil so that the vegetation growing in the pits marks the outline. The have been incised wherever there was room so that they are found at various levels. 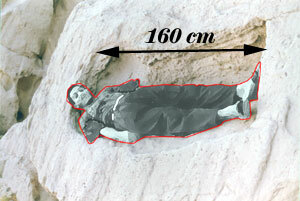 If on a slope side very shallow. There is no indication of the pits having been quarried for building block purposes and the usual impression is that they were used for gravesite. However the shallowness of the pits, and the absence to the covering stones, such as at the burial mounds in Jebal Shimali area, is puzzle, Outside of their use for burial rites no other explanation explained them. Similar pits are to seen cut into the base level outcrop of the Jebal Bint at Madain Saleh in Northwestern Saudi Arabia. Another objection raised is that the small size of the pits would not hold a normal adult body, which is true if they were incised to hold a complete adult body entirely. Descending from the summit and crossing the connecting road to the south there is low flat surface outcrop surrounded by trash. 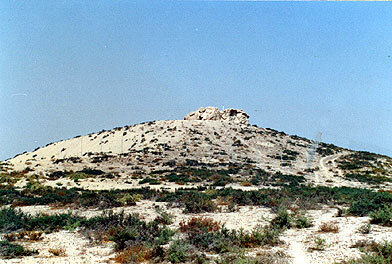 Most provably this outcrop is also connected to Jebal Qurain but the lower interconnection portion had been covered by drift sand in past time. On the flat top of this outcrop several similar small and shallow pits have been cut. On the edge of the north side a very large there sided pit has bee n quarried which measures approximately 12 feet in length by four feet in depth and four feet in width (see picture). Of the approximately 40 pits this is the only one which is of sufficient size that is could have quarried for stone. The north side of low edge a few inches high. The usual size of this pit is puzzling. One explanation that comes to mind is that it could have been used for a large number of dead who may have died as the result of the epidemic, accident or some other catastrophe which would have required a mass burial but this conjunction is not very plausible. The pit does not show any size of boreholes nor are there any cutting or stray pieces near the outcrop that might furnish a clue. There is always the faint possibility that it could have been for an extremely important or prominent individual.